The state of Chiapas is known for its tropical climate, lush rainforests, and in part for the civil war and internal conflict that plagued the area in the mid 1990s. It is also a "perfect microcosmic example of a peacekeeping situation," according to Elise Marubbio, a professor of American Indian studies, women's studies, film, and English at Augsburg. Last summer Marubbio led a group of students in Chiapas as part of the Nobel Peace Prize program. The Peace Scholars, students representing five Midwestern Lutheran colleges, spent nine days in Chiapas studying the history of conflict and peace in the state. Augsburg's Scholars are Katia Iverson, a sophomore cross-cultural studies major, and Jessica Spanswick, a senior majoring in international relations and peace and global studies. Marubbio structured the program by assigning readings and holding pre- and post-trip classes at Augsburg. 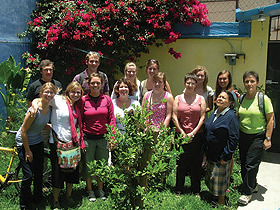 Students were encouraged to make connections between the Chiapas situation and indigenous peace and rights movements in the U.S. and Canada. Their final project includes group presentations, which they will give at the upcoming Peace Prize Forum at Augsburg. While in Chiapas, the group visited with women's groups, grassroots activists, NGOs, a Zapatista community, and indigenous schools. The students shared a memorable experience in Acteal, a site where 45 people were killed in a massacre. They met with an attorney who was involved with the prosecution of the paramilitary group responsible for the killings and a woman whose family had been killed in the massacre. The attorney was anticipating a court decision regarding the paramilitary group; he learned shortly after the Scholars' visit that they were acquitted. "We saw all the crosses representing the people who died," Spanswick said. "We just stood there in the pouring rain. We couldn't leave." Iverson said meeting people involved in diverse ways in the peace process was helpful for her. "I learned I can actually do something in the peace movement," she says. "Right where I am, I can make that change, reach out to others, and be a partner." Spanswick says the experience made her ask, "What is my role as a white American woman going into another place and saying I can help?" In particular, the group met with members of an NGO that have learned how to be helpful by understanding the needs of the community. "I saw that we need to revamp our strategies and realize what we don't know in order to help others," Spanswick says. Marubbio says the Chiapas program gave her an insider's perspective on the Zapatista movement, a subject she has been interested in for some time. "I saw amazing examples of indigenous sovereignty, and it is powerful to behold," she says. She adds that she was humbled by and grateful for the generosity of the people they met with in Mexico. "They accepted us, our ignorance sometimes, and our questions. They did so believing that by doing that we would do the same for others." Marubbio says she is especially grateful to Marisela Chaplin and Sister Lucy, two of the women who led the group. Chaplin is a staff member with the Center for Global Education in Cuernavaca. Marubbio says the Center's connections, staff, and commitment to experiential learning made the experience "a constant and wonderful learning process" for her. In cooperation with the Norwegian Nobel Institute, five Midwestern colleges of the Evangelical Lutheran Church in America sponsor the annual Nobel Peace Prize Forum. This prestigious event is the Norwegian Nobel Institute's only such program or academic affiliation outside Norway. Register and read more about the Forum on the website.